In terms of tracking market volatility, the VIX is far and away the most common measure for doing so. The S&P 500 option volatility index has been at the forefront of volatility indicators for well over a decade. Products based on the VIX also tend to dominate the volatility trading space. The VIX has finally gotten a true competitor in the SPIKES index which just recently launched. SPIKES tracks SPDR S&P 500 ETF (NYSE: SPY) options instead of SPX options (the S&P 500 index), but provides virtually the same market volatility information. It will be interesting to see how the VIX volume is impacted by the launch of SPIKES, which has much lower trading fees attached than VIX does. But for right now, the majority of trading action is still taking place in the VIX. And make no mistake, there can be a massive amount of options trading in the VIX on any given day. The VIX is used as a hedging (and sometimes speculating) product by major trading firms and funds across the globe. Some of the biggest trades you’ll ever see take place in the VIX. That being said, let’s take a look at an absolutely massive trade which hit the tape this past week. A fund or trading firm sold the VIX April 12.5-13 put spread and bought the May 25-27 call spread simultaneously for roughly even (no premium paid – they cancel each other out). This strategy was executed about 280,000 times… yes four zeroes. So how does a trade like this work? Let’s start with the max loss and max gain. If the VIX is lower than 12.50 at April expiration, the trade loses 50 cents. That would amount to $14 million based on 280,000 spreads trading. Max gain occurs if the VIX is equal or higher than 27 at May expiration and would be $2.00. That’s $56 million in dollar terms. But, because the trade was done for essentially zero premium, if VIX is anywhere above $13 in April and below $25 in May, there would be no gain or loss. That doesn’t include commissions of course, which were likely massive for this strategy. A zero gain or loss is the most likely scenario given the VIX median is right at 17. Why pay so much in commissions for a trade that isn’t likely to make money? It’s most likely a hedge against a major market selloff. The strategist doesn’t want to commit a bunch of capital to the hedge so is willing risk selling the April put spread. That means I wouldn’t take this a sign that volatility is going up (and the market is going down). 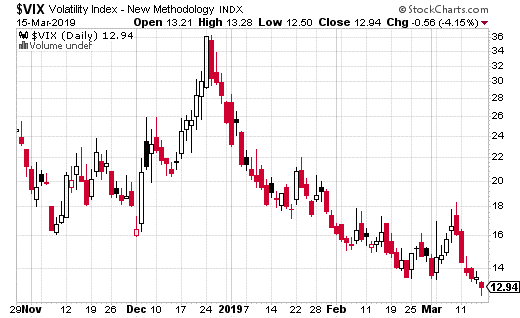 However, the fact the strategist is willing to risk $14 million on the VIX remaining above 12.50 by mid-April could be telling. It could suggest there’s a floor on how far the VIX will fall (and stay depressed) over the next month or so. This could be due to the various geopolitical risks on the horizon. Regardless, if you think volatility is going up or want to protect against it, you can make an inexpensive upside bet without taking the risk of using a short put spread to finance the trade. For instance, the April 20-25 call spread (buying the 20, selling the 25) only costs about $0.25 with VIX around 13. That’s a small price to pay for a hedge (or speculation). It also gives you the chance to make as much as $4.75 per spread if the VIX spikes in the next month.